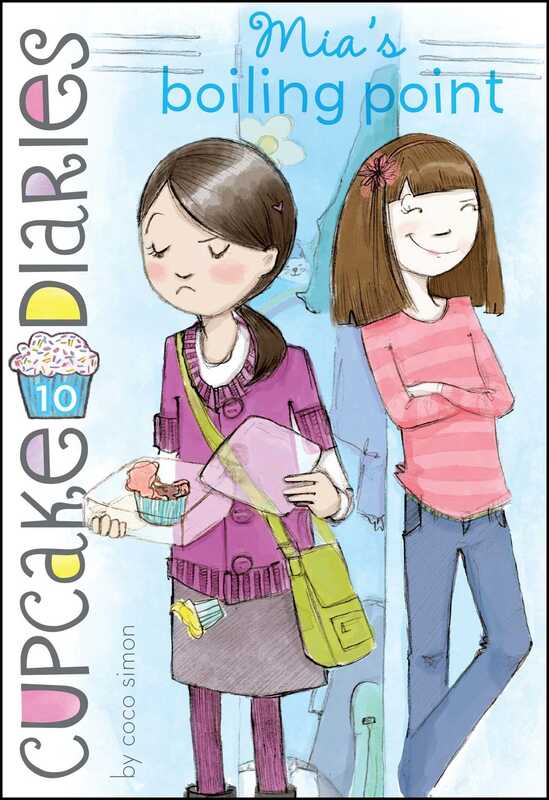 The Cupcake Club questions its loyalties when Mia makes friends with a mean girl in disguise. There’s a new girl in town, and Mia tries to take her under her wing. But Olivia Allen is not so nice; as a matter of fact, she might be even meaner than Sydney Whitman! Mia’s been saving for weeks to buy a new pair of shoes, but when Olivia asks to borrow money, Mia gives it to her—only to find out Olivia spends the cash on the exact same shoes Mia has been saving up for! Plus she makes fun of the other Cupcake girls and tells Mia she shouldn’t be friends with them. Will Mia see Olivia’s true colors before she wreaks havoc on the Cupcake Club? CHAPTER 1 A Middle School Miracle? Oh my gosh, it’s a cupcake plunger!” my friend Katie squealed. I don’t think I’ve ever seen Katie so excited. We were in a shop in the mall called Baker’s Hollow. They sell baking supplies, and inside are all these fake trees with built-in shelves and the supplies are displayed on them. Katie and I were at the cupcake tree, which has pretty, fake pink cupcakes “growing” in its fake branches. The shelves are filled with cupcake baking pans, cupcake decorations, and tons of different kinds of cupcake liners. Katie was holding up a metal tube with a purple top on it. She pulled on the top, and it moved up and down, like a plunger. Katie dug into her pocket, took out some crumpled bills, and started to count. That’s the difference between Katie and me—she doesn’t care about fashion at all, and I pretty much live for it. Today, for instance, Katie was wearing a purple hoodie, jeans, and sneakers. Which is perfectly adorable on her, but not dressed up enough for me. You never know who you could run into at the mall! So I had on skinny black jeans, my furry black boots, a white lace cami, and a sky-blue cardigan on top. The beads in my hoop earrings matched my cardigan, and the boho style of the earrings worked perfectly with my boots. But even though Katie doesn’t care much about fashion, she’s my best friend here in Maple Grove. I moved here a year ago after my parents got divorced. Katie was the first friend I met. “Okay, I’d better get on line before I buy something else,” she told me. A few minutes later we left the shop, and Katie was happily holding an adorable little paper shopping bag with a picture of a cupcake tree on it. “I bet you could think of an even better logo if you wanted to,” Katie said. That made me feel pretty good. I love to draw and would love to be a fashion designer or maybe a graphic designer one day. Or maybe one of those designers who does displays in store windows in Manhattan. How cool would that be? As we walked toward the smoothie shop, the smell of chocolate distracted us. Katie and I didn’t even need to discuss it. We walked right into Adele’s Chocolates and headed for the counter. This is a “must-go-to” shop at the mall. Adele makes all the chocolates herself, and the flavors are amazing. “That would make a good cupcake,” I said, and Katie nodded. We talk about cupcakes a lot because we’re in the Cupcake Club with our friends Alexis and Emma. It’s a real business. People hire us to bake for their parties and other events. I grabbed Katie’s arm and pretended to drag her out of the store. “Resist! Resist!” I said, and we both started laughing like crazy. It was Saturday, so the mall was pretty crowded as we made our way to Smoothie Paradise. I used to hate the mall when I first moved here, because I was so used to shopping in New York City. But now I like it. It’s never too hot or too cold, and when I’m done shopping I just have to carry the bags outside to Mom’s car. It’s definitely a lot easier than toting things home on the subway. Even though the mall was full of people, the line at Smoothie Paradise was pretty short. Katie and I each ordered the same thing—a smoothie with mango and passion fruit—and then sat down at a small round table in the corner. Eddie is my stepdad, and Dan is my stepbrother. They’re both pretty nice. “Is it getting any easier living in two different apartments?” Katie asked. I thought about it for a minute. “Yeah, kind of,” I admitted. “But mostly when I go to my dad’s, I feel like I’m visiting.” I basically go out to New York to see my dad every other weekend. “You must miss him,” Katie said. I wasn’t sure how to answer that. Katie’s parents are divorced too, and she never sees her dad. He remarried, and I think he even has a whole new family. So as tough as my situation is, I think Katie’s is even tougher. Katie got a little quiet after I said that, so I changed the subject. We left the shop and headed for Icon. It’s easy to find because you can hear techno music blasting from it even when the mall is noisy. The decor is really sleek and clean, with white walls and gleaming silver racks. I like it that way because the clothes are really highlighted. That day I walked right past the clothes and headed straight for the shoes, which were displayed on white blocks sticking out of the back wall. They had chunky heels, wedge heels, and spike heels, but the perfect shoe, the one I could picture in my head, wasn’t there. While I was looking at all the shoes, Katie was giggling and wobbling in a pair of superhigh silver heels. I suddenly heard a familiar voice behind us. It was Callie Wilson, Katie’s former best friend and the leader of the Best Friends Club, which used to be the Popular Girls Club. Things have always been pretty tense between the Cupcake Club and the BFC. A lot of it had to do with Katie and Callie’s broken friendship. But recently, they kind of patched things up, and so today Callie was smiling and friendly. Katie, on the other hand, looked a little startled. She quickly slipped out of the silver heels, embarrassed. “Oh, hey, Callie,” Katie said. Maggie and Bella, the other two girls in the BFC, walked up behind Callie. Maggie has wild hair and can be pretty funny when she wants to be—and pretty mean, too. Bella is the quietest of the three. She’s super into those vampire movies—like, so into them that she changed her name from Brenda to Bella, and she straightens her auburn hair to look just like the girl who loves the vampire. “Shopping for shoes?” Callie asked, even though it was pretty obvious. I guess she was trying to make conversation. “We’ll definitely check them out,” I replied. She walked away, and Bella and Maggie followed her. Katie and I stared at each other in shock. “Did that just actually happen?” Katie asked. “You mean, did we actually just have a normal conversation with the BFC, with no name-calling or teasing? Yes!” I replied. From cupcakes to ice cream and donuts! Having written over thirty books about middle school girls and cupcakes and ice cream, Coco Simon decided it was time for a change; so she’s switched her focus from cupcakes to her third favorite sweet treat: donuts! When she’s not daydreaming about yummy snacks, Coco edits children’s books and has written close to one hundred books for children, tweens, and young adults, which is a lot less than the number of cupcakes, ice cream cones, and donuts she’s eaten. She is the author of the Cupcake Diaries, the Sprinkle Sundays, and the Donut Dreams series.